The Phylo project is hard at work on preparing the next high quality Phylomon* deck, and this one will revolve around Charles Darwin and his wonderful 5 year voyage on the H.M.S. Beagle. At this point in time, we’ve enlisted the help of noted Darwinian aficionado, Karen James, who has nicely narrowed down the list of cards that are needed for this endeavour (see original google doc here). In turn, I have a group of folks in the backend of the phylo website, who have produced a number of nice looking “beta” cards that can be used to test things out (they used images from vintage natural history prints, many of which were actually produced by folks on the voyage itself – i.e. John Gould for example). These “beta” cards can be found on the phylogame website, but we’ve also produced a handy dandy 10 page pdf of the putative deck for easy printing and cutting (click on the image below to download – 11.5Mb pdf). Note, the rules for the game can be downloaded here. 1. The next two weeks, I’m hoping that some folks out there in the world wide web will print out this “beta” Darwin card set and give it a try: this way, we can finalize what the deck list needs to be. The reason why there is a time crunch on this, is that this finalized list will allow us to start the process of seeking out and commissioning artists for the production of lovely card art. 2. The species used are all species observed and noted during that fateful voyage. For now, they’ve been grouped according to certain legs of the trip (kind of by geography if you will). This was mainly because the actual sea voyage had a lot of going back and forth, so Karen thought that going with a temporal theme would be too tricky. Here you’ll note that the geography categorization is mentioned in the card text (i.e. 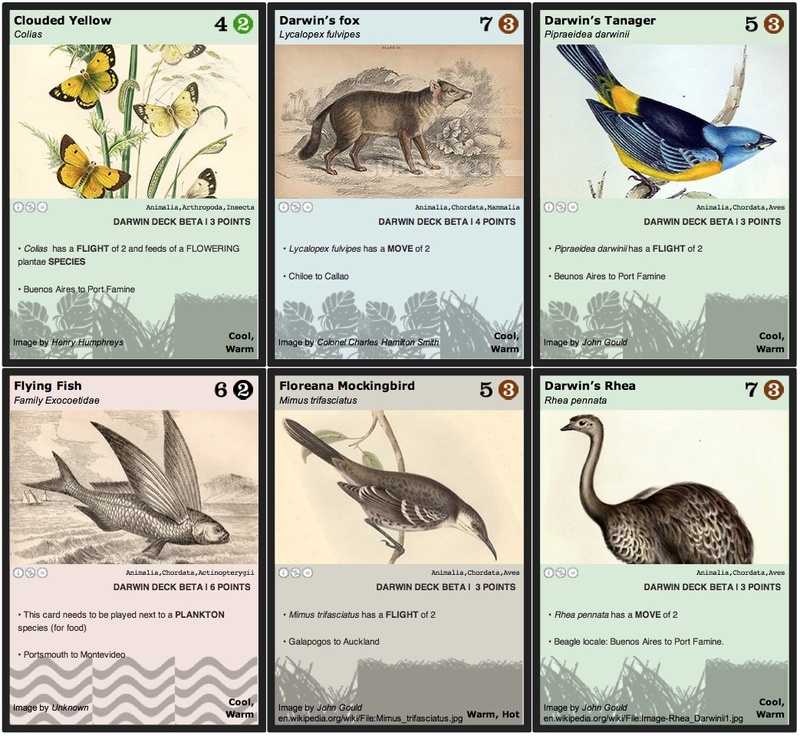 “Galapagos to Auckland), but we’ve also coordinated the background colours of the cards themselves, to make this easier to see (some cards have a reddish background, some brownish, etc). 3. With the geographical mode of categorization, and because the H.M.S. Beagle itself traversed a significant part of the globe, it turns out that when one plays this game, there will often be cases where an organism can be played adjacent to another where the compatibility rules work, but that they would never actually be in the same part of the world (i.e. technically, some connections would not be grounded in reality, as usually decks are organized around locality unlike this one). Here, players will need to make a judgement call on how important this is. In other words, I’d like to hear people’s opinions on what they think about this. We think the cards can still be played in a scientifically literate manner (i.e. using the background card colour to help guide these more “real” connections), but that being overly strict will likely make the game much more finicky. Perhaps there are options out there where the scientifically literate connections (i.e. via background card colours) are worth more points, or are immune from event cards, etc. We’d love to hear your thoughts. 4. The current list of “Event Cards” were pretty hastily made and largely influenced by availability of cool vintage paintings. Since the final deck will involve art commissions, we’re actually a lot more free to come up with much more clever event cards. Would love to hear more ideas here. 5. And since we’re asking for help generally, there is also a much bigger challenge at stake. Karen and I are very intrigued by the idea of tweaks to the current rules that allow folks to follow the voyage in a “temporal” manner. i.e. the possibility of “history cards.” Mostly, event cards change the food chain connections, or alter the game play where someone has a logistical advantage or disadvantage (i.e. The pdf you’ve been provided with is pretty much the usual ecosystem type building game, which we know works pretty well). With the possibility of “history cards” we want to see if there are elements to the game that can illustrate things in a time dependant (i.e. historical) manner. This is actually why the pdf has a number of blank cards. These have been included in case anyone out there has a cool idea they want to test out, since we currently have no idea what this might look like, or know how doable it is. Furthermore, we’re not even sure if it’s something we want to try to sort out now, or perhaps later with the release of Darwin themed expansion packs (i.e. no rush to do this, but super mega bonus points if someone does have a go). Anyway, for folks who do help out, please leave commentary somewhere for us to find (if not in comments sections, then maybe at the forum, or via email – db at mail dot ubc dot ca). Anybody who comes up with some excellent suggestions/commentary will be eligible to receive the Darwin deck when all is said and done (and also the Beaty Deck as well). Note if the contribution is outstanding, we’ll also make sure you’ll be properly attributed in the final version of the deck itself.